Today, it’s more important than ever to keep your computer safe against a wide array of threats. However, it has also never been easier to do so. We compared PC Protect and TotalAV, two top antivirus suites, to see which one comes out on top. We recommend TotalAV although both products deliver excellent solutions. Read on to discover how they stack up! Although both antivirus suites fly under the radar compared to the big names, PC Protect and TotalAV provide subscribers with a variety of tools that can help keep them safe when browsing online or connecting to networks. Our technology experts have taken a deep dive into both systems to compare and see which one offers the best value for users. Keep reading to see the pros and cons of each service and discover which one came out on top. Users can take advantage of useful benefits available from both antivirus tools though each offers different strengths. PC Protect provides a variety of real-time protection tools that include malware and spyware detection, as well as daily scans. It scans downloaded files to ensure no viruses or malicious software is hidden within. In addition, users receive an integrated ad blocker, as well as the company’s Web Shield and VPN. However, PC Protect falls behind TotalAV in overall protection scores, rating slightly lower on the scale. By comparison, TotalAV includes robust antivirus and spyware protection, and scans for malicious URLs and signatures when browsing online. To add to the browsing benefits, the company offers an integrated VPN to protect online activity even further. Users are also protected from malware and phishing protection with real-time updates. Though the company is relatively new, it has promised to build on its already intriguing product. Impact: In our tests, PC Protect tested positively for performance impact. While antivirus software can sometimes cause lag or performance issues, PC Protect generally does not seem to have much of an impact on speed. We found that PC Protect only uses about 80MB of RAM when not performing a system scan. However, we did find that in some cases such as scans, PC Protect does cause a degree of hardware slowdown. TotalAV similarly operates with very little impact on a computer’s overall performance. While TotalAV is prone to common pop-up notifications, the frequency of these alerts can be customized and even turned off by the user. Scans take an above average amount of time to complete, but luckily, do not have a noticeable impact on computer speed, even when running on computers with older hardware. Updates: We were pleased to see that both companies regularly update their services and definitions. TotalAV licenses its antivirus and definitions from established company Avira and has been rated highly for its comprehensive protection against even the newest threats. PC Protect lags slightly behind in this category though it does update its definitions and services regularly. Nevertheless, it does sometimes expose users to zero-hour attacks, though these windows are few and far between. Parental Controls: Unfortunately, neither PC Protect nor TotalAV come with parental control options included. However, TotalAV’s website indicates they will soon be integrating parental controls to their platform, along with a variety of other upcoming features. Identity and Privacy Safeguards: We were impressed to see both PC Protect and TotalAV provide their customers with a Safe Browsing VPN which keeps encrypts their internet connections. Each companies’ VPNs tested positively and are an excellent addition for any antivirus suite. Additionally, the two companies offer password vaults to keep sensitive information properly secured. Multiple Devices: TotalAV and PC Protect are designed to safeguard computers running Windows, Mac OS, and all devices running iOS and Android. However, TotalAV provides its subscribers with coverage across 3 devices with a subscription, edging out the comparable offering from PC Protect. File Backup: Often, antivirus platforms come with system or file backup capabilities in case of corrupted or lost files. Unfortunately, neither PC Protect nor TotalAV provide file backup solutions. However, TotalAV’s website indicates that they will soon be integrating a file manager protocol with their existing platform. For greater ease of use, TotalAV and Protect PC have a friendly interface that lets even the non-tech savvy operate and customize their antivirus platform of choice. However, we were more impressed with TotalAV’s user interface. It is noticeably cleaner, and we found it quite intuitive while still leaving room for user customization. For customers with questions, both PC Protect and TotalAV host extensive FAQs and help sections. We were very impressed to see that both platforms offer a live chat feature for dealing directly and quickly with a live representative on the website. We found the agents to be professional and courteous, and equally knowledgeable when dealing with tough questions regarding their respective platforms. Each platform provides an around-the-clock phone support line, as well as email inquiry support, with reasonable response times and knowledgeable insights. Customers can choose from one of PC Protect’s three membership tiers. Subscribers can purchase the Essential Antivirus for $99.95, Antivirus Pro for $119.95, or its Ultimate Antivirus system for $149.95. Each purchase comes with a 30-day money back guarantee. It is important to check with the PC Protect website as the company regularly opens introductory deals which reduce the price by more than half for the first year. 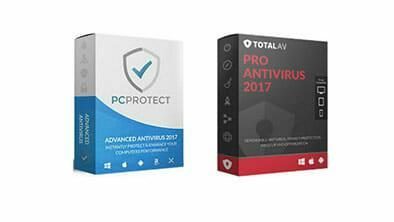 TotalAV has the exact same offering on all 3 packages – Essential Antivirus for $99.95, Antivirus Pro for $119.95, or its Ultimate Antivirus system for $149.95, but it provides support across three devices. TotalAV extends a 30-day money back guarantee to its new customers to help users feel more comfortable with its solution. Neither platform offers a free trial to test their full platform offerings. Overall, we found similar services in both TotalAV and PC Protect. They are streamlined antivirus platforms for users who want fast antivirus protection without heavily impacting computer performance. While both offer a simple and effective antivirus platform, we liked that TotalAV is developing and will soon implement several new features into their software such as Parental Controls, a file backup system, and a browsing performance enhancer. PC Protect is a useful solution for users who are seeking a basic antivirus service with good protection. However, we recommend TotalAV’s solution thanks to its powerful tools, excellent price point, and the potential for expansion. Aren’t they owned by the same company? Their websites look very similar and so I checked out the domain registrations and totalav.com and pcprotect.com are both owned by Data Protected Data. No, these are two completely separate AV competitor companies.